HSH Coldstores operates in a fast-moving business sector.Customers expect HSH Coldstores to be highly responsive to their request. As a result, the company had for many years been using an IMAP email solution comprised of mobile devices couple with MDaemon which enabled the company’s managers to move freely about the vast warehouse facility, and at any moment of the day they could be reached by telephone or email, without being tied to their desk. 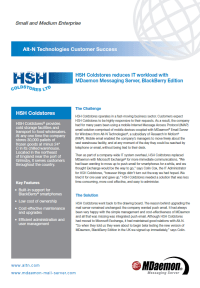 Today HSH Coldstores uses MDaemon Messaging Server, BlackBerry Edition, coupled with BlackBerry smartphones. “It’s exactly what we were looking for: reliable push technology for email and calendar at the right price, ” says Colin Cox, IT Administrator for HSH Coldstores.